The race for School Board in MNPS is starting early, as current Board Member Will Pinkston announced his re-election plans this morning and saw Jackson Miller confirm within hours that he would challenge Pinkston. Jason Gonzales and Joey Garrison have the story for the Tennessean. Miller plans to make a formal announcement tomorrow. The Tennessee State Board of Education today used authority granted to it by the General Assembly in 2014 to approve two KIPP charter schools that had previously been rejected by the MNPS Board of Education. The decision means the State Board has decided which schools will be opened and funded by MNPS rather than that decision being left to the elected School Board. The authority was given to the State Board because of the Great Hearts Controversy. 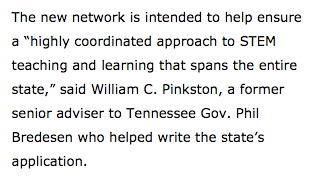 Back in 2012, MNPS rejected an application filed by Great Hearts to open a charter school. The State Board heard an appeal from Great Hearts and sent the issue back to the MNPS Board, recommending approval. MNPS refused. Then-education commissioner Kevin Huffman fined MNPS $3.4 million. And legislators, ever eager to micro-manage public education to the point of absurdity, filed legislation. It will be interesting to see how MNPS reacts to this course of action. The State Board has authorized the expenditure of Nashville tax dollars in a very specific manner, directing that those funds go to support the opening and operation of two KIPP charter schools. 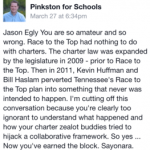 It’s not like MNPS is averse to charter schools. Many charter schools operate in the district and the Board did approve some charter applications this year. In fact, in 2014, the Board signed off on a plan to give KIPP an elementary school. As Dr. Register proceeded, this action actually led to the formation of East Nashville United. At that time, the focus of the possible takeover was Inglewood Elementary. NEA President Lily Eskelsen Garcia even visited the school to build support for preventing a KIPP takeover there. Ultimately, KIPP won the right to takeover Kirkpatrick Elementary. 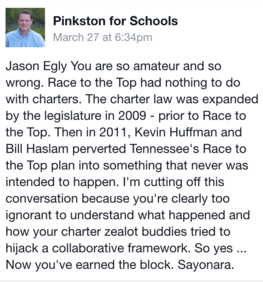 All of this to say: The majority of the MNPS Board has not demonstrated a bias against charter schools or even KIPP. The school board took a fiscally conservative position. With 8,157 seats currently in the charter pipeline — including more than 1,000 yet-to-be-filed seats belonging to KIPP — that’s a total future annual cash outlay of $77.5 million. Pinkton’s argument and other analysis suggesting that charter schools do place a burden on the MNPS budget prompted Board Member Mary Pierce to respond with a straw man argument about the cost of closing all current metro charter schools. The fact is, MNPS hasn’t been in the business of closing charter schools — they’ve been approving new charter applications nearly every year and have many more charter seats opening. It seems likely that the KIPP charter schools approved by the State Board today would have ultimately won MNPS Board approval. But today, the State Board of Education decided they knew better than Nashville’s School Board when and how many charter schools should be opened in Nashville. They also obligated funds, including local funds, to the opening and operation of these schools. charter schools authorized by the state board of education shall be performed by the state board. As requested, the department of education shall assist the state board with general oversight of any charter school authorized by the state board. (Public Chapter 850, 2014). MNPS Board Member Will Pinkston offers some thoughts on the fiscal impact of Nashville’s Charter Sector and makes a plea for the reasonableness of slowing their growth in a recent op-ed in the Tennessean. MNPS is ranked 54th out of 67 urban school systems in America in per-pupil funding. A recent analysis of teacher pay across urban districts similar to Nashville found the city’s teacher lag behind their peers, especially in Louisville — a city of similar size and cost-of-living. In short, there are lots of charter seats now and a lot more coming online even if MNPS doesn’t approve a single new charter application. These schools are a fiscal drain on MNPS. In some cases, this may be a worthy investment. But, Nashville residents should consider if they want a tax increase to support charter expansion OR if they believe any new money coming from a state school funding lawsuit should be directed at charter expansion rather than other education initiatives. Students, parents, teachers and public education advocates are gathering Tuesday, Sept. 1, for a screening and discussion on the trend of corporate takeovers of American public schools examined in the documentary Education, Inc. Screening of the film begins at 6:00 pm followed by a panel discussion at Vanderbilt Wilson Hall 103, located at the intersection of Terrace Place and 21st Ave. (Metered parking is available around the space.) Panelists include: Nashville School Board member Will Pinkston, Nashville school teacher Amanda Kail, and Nashville parent Chelle Baldwin. Several groups from Tennessee have come together to sponsor the event: Tennesseans Reclaiming Educational Excellence, Metropolitan Nashville Education Association, Statewide Organizing for Community eMpowerment, Vanderbilt Students of Nonviolence and Vanderbilt Students Engaging in Education Dialogue (SEED). engage local communities across the country. They have made the film available for house parties and community screenings by simply purchasing a DVD. Their hope is that students, parents, citizens and public school advocacy groups will use the film to help start an important conversation about the role and value of public education in America. The MNPS School Board has narrowed its search for the next Director of Schools. The Board heard from four finalists last week on Thursday and Friday. After those interviews, the board eliminated John Covington from the mix and will proceed with interviews of the remaining three candidates. The MNPS School Board has been presented with a slate of four finalists for the Director of Schools position. The Board may select from among the four presented or choose another candidate not listed. Currently, it seems the plan is to pursue further study of the four named finalists. • John Covington, consultant with the Broad Center. Covington is a former educator who has 29 years of experience in public education. He has worked in Pueblo, Colo.; Kansas City, Mo. ; and served as the chancellor of the Education Achievement Authority of Michigan. The authority is somewhat similar to Tennessee’s Achievement School District. • Angela Huff, chief of staff for the Cobb County School District. Huff, a Nashville native, oversees 110,000 students and a staff of more than 11,000 in the Atlanta school district. She has 31 years working in education as an assistant superintendent and principal in Cobb County, and she has also served as a teacher in Gwinnett County Public Schools. Today’s unveiling of candidates follows two weeks of controversy over who would be the interim Director of Schools. And, this morning, Board Member Will Pinkston offered his thoughts on the priorities the next Director should emphasize.